I was born in Millbury, Massachusetts in 1977. While studying theater production at Emerson College in 1996, I discovered painting and began my pursuit of fine art. After several years in Boston travelling and showing in alternative spaces, I made my way to Brooklyn, New York in 2002. 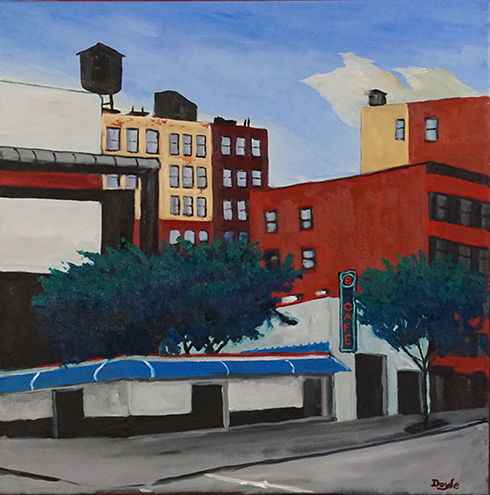 In New York, I continued showing artwork and started a neighborhood based artist group called “Meeker Avenue Artists”. In 2009, I left New York to enlist in the United States Army. After my enlistment, I moved to Tucson and received a BA in Art History at the University of Arizona. While pursuing my degree, I continued painting and became a fixture in the downtown Tucson art community, showing at Contreras Gallery, Raices Taller and Solar Culture Gallery. In January 2015, I returned to Brooklyn, where I had a very nice time working for the Guggenheim. But, I have returned home to Millbury where I currently live and paint. My work, primarily painting, focuses on the places that we inhabit. I am interested in how our structures are built, how they fit or don’t fit into the landscape and how we feel about places. My paintings are representations of my observations.